Parent-Child Interaction Therapy and Training is available to birth parents, foster parents, adoptive parents, grandparents and other caregivers who are raising a child between the ages of 2-8. Is your child having behavior problems at home, school or daycare? Is your child constantly arguing with you? Does your child refuse to follow directions? Does your child anger quickly or throw temper tantrums? Do you find yourself yelling at your child or losing your temper? Does your child have difficulty attending school? If so, you are not alone! 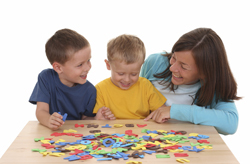 Behavior problems among young children are fairly common and when addressed early can be effectively treated. PCIT is a program for families backed by 20 years of research and is scientifically proven to be successful in reducing children's behavioral and emotional difficulties and improving the quality of relationships between parents and their children. Parents and children play together while a therapist, who is observing through a two-way mirror, talks to the parent through an earpiece. In this program, parents are taught specific skills that will help foster a more positive relationship with their child and help decrease their child's negative behaviors. There are also coaching sessions alone with the parent to teach and model the specialized parenting skills practiced in PCIT.